Herpes simplex virus (HSV) type-1 and type-2 have evolved numerous strategies to infect a wide range of hosts and cell types. The result is a very successful prevalence of the virus in the human population infecting 40-80% of people worldwide. HSV entry into host cell is a multistep process that involves the interaction of the viral glycoproteins with various cell surface receptors. Based on the cell type, HSV enter into host cell using different modes of entry. The combination of various receptors and entry modes has resulted in a virus that is capable of infecting virtually all cell types. Identifying the common rate limiting steps of the infection may help the development of antiviral agents that are capable of preventing the virus entry into host cell. In this review we describe the major features of HSV entry that have contributed to the wide susceptibility of cells to HSV infection. Herpes simplex viruses (HSV) are part of the alphaherpesvirus subfamily of herpesviruses. There are two types of HSV: type-1 (HSV-1) and type-2 (HSV-2). These viruses are neurotropic capable of infecting the nervous system and causing neurological diseases. Moreover, HSV results in a lifelong infection by establishing latency in the host sensory neurons and replicating in epithelial cells during primary infection and reactivation . The virus is spread and transmitted among humans through physical contact and commonly causes localized mucocutaneous lesions . Oral and ocular lesions are primarily caused by HSV-1 and genital lesions by HSV-2. However, HSV-2 is capable of causing ocular lesions in newborns of HSV-2 infected mothers. In that case, HSV-2 is transmitted to newborns primarily during peripartum period as a result of disrupted membranes, or by direct contact with the mother's vaginal secretions and infected cervix [3, 4]. These viruses are also capable of causing more serious diseases, such as blindness, meningitis, and encephalitis . HSV-1 is a leading cause of viral corneal blindness and viral encephalitis in developed countries [6, 7]. • Involvement of several multifunctional HSV glycoproteins in entry. • Existence of multiple alternative receptors. An array of HSV entry receptors for HSV glycoproteins already exists, and evidence suggests even more unidentified HSV receptors. • Multiple entry modes. HSV has the ability to enter into host cells by direct fusion with the plasma membrane, or via endocytic pathways. The latter can be pH dependent or independent. • Multiple spread strategies of HSVs, including: transmission of free virions, movement of HSV along filopodia-like cellular membrane protrusions (surfing) towards the cell body, and lateral cell-to-cell spread. This review discusses recent advances in the field of HSV entry and highlights the strategies exploited by the virus to infect a wide range of hosts. The mature infectious HSV consists of four components from the core outward: an opaque dense core that contains linear double stranded DNA (approximately 152 kB), encoding at least 74 genes . HSV genome is encapsulated within an icosahedral capsid that consists of 162 capsomeres with six different viral proteins (VPs) present on the surface . The capsid is surrounded by a protein layer called the tegument that contains 22 VPs. Finally, an outer envelope that contains 16 membrane proteins, including 12 different proteins that contain oligosaccharide chains (glycoproteins). These glycoproteins are of particular importance for the purpose of this review since their interactions with the host cell surface proteins mediate HSV entry into the cell. These glycoproteins are: gB, gC, gD, gE, gG, gH, gI, gJ, gK, gL, gM, and gN [10–12]. Some of these glycoproteins have been found to exist as heterodimers including the heterodimers gH-gL and gE-gI. Many associate with each other, and have the potential to function as oligomeric complexes . In addition, these glycoproteins are suggested to have distinct size, morphology and distribution in the viral envelope, based on studies that have used the electron microscope, and monoclonal antibodies against the viral glycoproteins gB, gC, and gD. Accordingly, gB forms the most prominent spikes that are about 14 nm long with a flattened T-shaped top, invariably clustered in protrusions of the viral envelope. While gC were up to 24 nm long distributed randomly, and widely spaced. gD seemed to be 8-10 nm long, clustering in a distinct irregular pattern . HSV entry into host cell is a multistep process that is a result of fusion between the viral envelope and a host cell membrane. It is mediated and modulated by the action of seven HSV glycoproteins along with their interactions with their cognate receptors. These glycoproteins are gB, gC, gD, gH, gK, gL, and gM . However, only four of these glycoproteins (gB, gD, gH, and gL) are necessary and sufficient to allow virus fusion with the plasma membrane of the host cell (Figure 1) [15–18]. HSV-1 glycoproteins required for viral entry and their identified receptors. HSV-1 entry requires the glycoproteins gB, gD, and the heterodimer gH-gL. Some of the receptors are exclusive to HSV-1 including PILRα and 3-OS HS. The first step in HSV entry is the attachment of HSV through the envelope glycoproteins gB and/or gC to heparan sulfate proteoglycans (HSPG) on the surface of the host cell . The purpose of this interaction is thought to tether the virus to cells in order to concentrate the virus at the cell surface . Although gC enhances HSV binding through its interaction with heparan sulfate (HS), it is not essential for entry . The next step in entry is specific interaction between HSV gD and a gD receptor . Several gD receptors have been identified, and they are discussed in more detail below. This interaction allows for tight anchoring of the virion particle to the plasma membrane of the host cell, and brings both the viral envelope and the cell plasma membrane into close juxtaposition . It is thought that the interaction of gD with one of its receptors triggers a cascade of events that lead to membrane fusion. Structural studies of gD prior to receptor binding and in complex with a receptor suggest that gD undergoes conformational change upon receptor binding, which may transmit an activation signal to gB, and gH/gL leading to membrane fusion. Thus, fusion requires the formation of a multiprotein complex (a fusogenic complex) comprised of gD, gB, and gH/gL [21–25]. A proline-rich region (PRR) of gD has been shown to be important for this process . Whether this region becomes exposed to contact gB and gH/gL upon receptor binding, or this region functions as a flexible joint to expose an unidentified region is still unknown. gD crystal structure reveals that its ectodomain consists of a V-like immunoglobulin (IgV) core that is wrapped by two topologically and structurally distinct extensions: N-terminus which has the receptors binding sites, and the C-terminus that has a domain required for triggering viral membrane fusion [21, 27, 28]. Various gD receptors bind distinct binding sites on the N-terminus [29–31]. Soluble gD has been shown to be sufficient to allow the entry of gD-null virus into the host cell . In addition, soluble forms of gD receptors have been also shown to be sufficient to allow wt virus entry into cells lacking gD receptors . These observations suggest that gD binding to its receptor is important to modify gD so that it can trigger fusion. A number of studies support the idea that the C-terminus of gD binds to the N-terminus resulting in an autoinhibitory closed conformation. gD receptor binding results in conformational change where the C-terminus is displaced adopting an open conformation, and thus activating the fusion machinery [26, 34]. Although gB does not promote membrane fusion by itself, its crystal structure reveals that gB share some properties with other class I and class II fusion proteins. gB belongs to a newly defined class of fusogens: class III. It is a multidomain trimer that is suggested to undergo a complex and ordered refolding process to drive fusion . Currently solved gB structure is predicted to represent the post-fusion conformation of the protein . It possesses five domains and two linker regions in each protomer of the trimeric ectodomain: (Domain I) has the fusion loop, (domain II) is located in the middle, (domain III) is an α-helical coild coil that represents the core of the protein, (domain IV) is the crown domain that has the epitopes for HSV specific neutralizing antibodies, and (domain V) is the arm domain that consists of a long extension spanning the full length of the protomer and contact to the other two protomers [5, 36–38]. The long linker regions are suggested to allow gB conformational change during fusion. Some investigators suggest gH/gL to have a fusogenic activity by initiating hemifusion . However, a recently resolved crystal structure of HSV-2 gH/gL revealed that gH/gL structure does not resemble any known viral fusogen . Moreover, a recent study, using cell fusion assay demonstrated that gD, a gD recptor and gH/gL heterodimer are unable to induce hemifusion formation . Consistent with these results, a model was proposed where conformational changes in gD, upon its receptor binding, enable it to activate the heterodimer gH/gL into a form that binds to and activates gB fusogenic activity . Thus gH/gL is suggested to act as a regulator of the fusion process by gB rather than a fusogenic glycoprotein . The interaction of the heterodimer gH/gL with gB does not seem to require the presence of these glycoproteins on the same membrane; since cell-cell fusion has been reported when gB and gH-gL were expressed in trans on different cells . HSV attachment to HS is the first step of HSV infection. HS is abundantly expressed on the surface of almost all cell types as HSPG. Additionally, the highly sulfated HS possesses negative charges making it suitable to interact with the positively charged viral glycoproteins . Evidence for this interaction stems from the observations that HSV attachment to cell lines that are defective in HS biosynthesis, but not chondroitin sulfate (CS) biosynthesis is reduced by 85% causing a significant reduction in infectivity in these cell lines . Moreover, soluble heparin, which is closely related to HS, binds HSV, causing an inhibitory effect on HSV binding to host cells . Enzymatic digestion of HS reduces HSV infection . The viral glycoproteins gB and gC are involved in the attachment to HS. The affinity of gB and gC to HSPG is different for HSV-1 and HSV-2. While HSV-1 gC has critical role in HSPG attachment during HSV-1 entry, HSV-2 gB is the key glycoprotein for HSV-2 attachment to HSPG [46, 47]. The difference in HSV-1 and HSV-2 gB and gC affinity to HS is suggested to influence several biological activities including sensitivity to polyanionic and polycationic substances . Although viral attachment to HS enhances the infection, the lack of gC on the viral envelope, or the lack of HS on cells lowers the efficiency of the infection, but does not prevent it [49, 50]. The lack of gB prevents the infection, primarily because of its critical role during membrane fusion of the virus. In addition to differences between HSV-1 and HSV-2 in the key glycoprotein that interacts with HS during virus attachment, it has been shown that HSV-1 and HSV-2 interact differently with the various structural features of cell surface HS . HS binding can also play a role in the virus's ability to form larger plaques since a mutant virus deleted for a putative HS binding lysine-rich sequence in gB (residues 68-76) showed reduced plaque sizes . Although the role of HS as an attachment receptor has been intensively studied, little is known about the contribution of the core protein that carries the HS chains. It is known that several families of HSPG have been identified, and one major family is the syndecan family of HSPG . Recently, work from our lab has shown that two members of the syndecan family of HSPG (syndecan-1 and syndecan-2) play a role during HSV entry . The downregulation of these syndecans using specific small interfering RNA (siRNA) resulted in a significant reduction in HSV entry and plaque formation. These results were confirmed using antibodies blocking assay, where antibodies against syndecans were capable of inhibiting viral entry . Interestingly, HSV infection resulted in the upregulation of syndecan-1 and syndecan-2 expression on the cell surface and at the protein level . This observation strongly suggests that these HSPG are involved in the infection, and most probably beyond the attachment step of the infection. Future studies will determine the exact contribution of the various members of the syndecan family in HSV infection. Table 1 lists HSV know entry receptors for some of the tested human cell lines. Several lines of evidence suggested that gD is capable of interacting with a cellular receptor. Firstly, the recognition of a phenomenon called gD-mediated restriction to infection or interference. Cells that constitutively express gD become resistant to infection [55, 56]. Secondly, truncated soluble form of gD binds to cells until reaching a saturation level . Through generating viral mutants that were able to infect gD expressing cells, the presence of multiple gD receptors was predicted . Currently, there are three classes of gD receptors that belong to structurally unrelated molecular families. Also called herpesvirus entry mediator A (HveA), is the first gD receptor identified through screening HSV resistant cells transfected with human cDNA libraries . HVEM is a member of the tumor necrosis factor (TNF) receptor family and a regulator of immune responses as part of its normal physiological functions . It binds to HSV gD and mediates HSV entry into entry resistant Chinese hamster ovary (CHO) cells [59, 61]. HVEM is expressed in a variety of cell types including T and B lymphocytes, other leucocytes, epithelial cells, fibroblasts and trabecular meshwork and human tissues including the lung, liver, kidney and to less extent in the brain [19, 59, 62]. They were first described in literature as poliovirus receptor-related protein 1 and 2 (Prr1 and Prr2) and later renamed as HveC and HveB and eventually nectin-1 and nectin-2 after the discovery of their roles in cell adhesion [63–67]. These cell surface proteins belong to the four membered nectin family of the immunoglobulin superfamily and only nectin-1 and nectin-2 from this family have been shown to mediate HSV entry through their interaction with gD [61, 65, 66, 68]. Nectin-1 has been shown to serve as a receptor for all tested HSV-1 and HSV-2 strains. It is broadly expressed in a wide range of human tissues (e.g. central nervous system (CNS), ganglia, skin, trachea, prostate, thyroid, and liver) and cell lines (e.g. epithelial, endothelial, fibroblastic, keratinocytes, haematopoietic and neuroblastoma) . However, nectin-2, that shares 30% homology with nectin-1 at the protein level, serves as a receptor only for HSV-2 and some unrestricted HSV-1 mutants that do not exhibit gD-mediated restriction of infection. Nectin-2 is considered a low efficiency receptor; therefore, cells expressing nectin-2 requires high multiplicity of infection in order to be infected. The reason of that is thought to be a result of weak physical interaction between nectin-2 and gD (HSV-2 gD, or HSV-1 gD mutants) [66, 68]. Nectin-2 is expressed in numerous human tissues (e.g. placenta, kidney, lung, prostate, pancreas, and thyroid) and human cell lines (e.g. epithelial, endothelial, and neuronal) . 3-OS HS is a highly sulfated form of HS that has been shown to serve as a HSV-1 gD receptor, but fails to bind to HSV-2 gD . The 3-O-sulfotransferases family of enzymes is responsible for the generation of the 3-O-sulfation, where each isoform of these enzyme is capable of generating its unique 3-OS HS. 3-OS HS generated by all the isoforms of the 3-O-sulfotransferases, except for one, are capable of binding gD and mediating virus entry. These enzymes have a distinct expression pattern in cells and tissue making them regulators of HS functions . Using soluble 3-OS HS, it has been shown that 3-OS HS is capable of triggering not only virus entry, but also HSV-1 induced cell-cell fusion . Furthermore, the downregulation of a prerequisite for the formation of 3-OS HS; 2-O-sulfation, was found to significantly inhibit HSV-1 binding, entry and virus induced cell-cell fusion . 3-OS HS is expressed in less variety of tissues and cell lines compared to nectin-1. It is found to be expressed in these tissues: liver, placenta, heart, kidney, and pancreas. It is also expressed by the human endothelial cells . In addition, 3-OS HS appears to play a major role in HSV-1 entry into primary cultures of corneal fibroblast . gB is known for its role in attaching to HSPG for tethering the virus to the cell surface, as well as its crucial role during membrane fusion of the virus. Although virus attachment to HS via gB and gC enhances the infection, the virus can still infect cells deficient in HS synthesis . Using soluble gB, it has been shown that gB is capable of binding to HSPG deficient cells, and block virus entry, suggesting the presence of a gB receptor . Recently three gB receptors have been identified where gB is capable of interacting with these receptors mediating HSV-1 infection. PILR is one of the paired receptor families. It is expressed mainly in immune cells where one receptor in the family has activating function, while another receptor in the family mediates inhibitory functions. While inhibitory receptors generally recognize self-antigens such as MHC molecules, activating receptors do not recognize self-antigens. Pathogens may utilize the inhibitory receptors to evade the immune system. PILRα has an immunoreceptor tyrosine-based inhibition motif (ITIM) that delivers inhibitory effects. Expression of PILRα in HSV resistant CHO cells renders these cells susceptible to the virus. Moreover, treating susceptible cells with anti-PILRα or anti-HVEM blocked HSV-1 infection, indicating that both gB receptor and gD receptor are required for HSV infection . Interestingly, PILRα has been shown to confer susceptibility to HSV-1 entry, as well as other alphaherpesviruses, including pseudorabies virus, but not HSV-2 into HSV resistant CHO cells . The association of PILRα with HSV-1 gB depends on the presence of sialylated O-glycans on gB with two threonine residues on gB found to be essential for principal O-glycans addition to gB . MAG (also called Sialic-acid-binding Ig-like lectin (Siglec)) is another paired receptor that has 5-12% homology with PILRα . It is localized in the periaxonal space in glial cells suggesting its importance in regulating myelin-axon interactions, including myelination, initiation, and myelin integrity maintenance. Using MAG-/- mice, MAG has been shown to function as an inhibitor of axonal regeneration . MAG associates with HSV-1 gB as well as varicella-zoster virus (VZV) gB and confers susceptibility to HSV-1 and VZV in MAG-transfected promyelocytes and oligodendroglial cells respectively . Since MAG is not naturally expressed in epithelial cells and neuronal cells which are considered prime targets for HSV-1 and VZV, MAG is not thought to serve as a major receptor for these viruses. However, both HSV-1 and VZV infect glial cells in the acute phase of infection, suggesting that MAG might be involved in the neurological disorders caused by HSV-1 and VZV. NM II binds to actin and has actin cross-linking and contractile characteristics. It is a key protein in the control of many events that are involved in cell reshaping and movement; including cell migration, cell adhesion and cell division. NM-II is composed of two heavy chains, two regulatory light chains, and two essential light chains. NM IIA is one isoform of the NM II protein . NMHC-IIA was identified as an HSV-1 gB receptor using a tandem affinity-purification approach with a membrane-impermeable crosslinker coupled with mass-spectrometry-based proteomics technology . NMHC-IIA has been shown to physically interact with HSV-1 gB, and mediate HSV-1 infectivity both in vitro and in vivo. Human promyelocytic HL60 cells stably expressing high levels of NMHC-IIA exhibited a significantly higher susceptibility to HSV-1 infection compared to cells expressing low levels of NMHC-IIA. NMHC-IIA role as an entry receptor was also exhibited in naturally permissive cells that express NMHC-IIA endogenously. NMHC-IIA functions primarily in the cytoplasm. However, interestingly, NMHC-IIA cell surface expression was shown to be induced after HSV-1 adsorption at 4°C that was followed by a shift in temperature to 37°C . While PILRα and MAG expression is limited to certain types of cells, NMHC-IIA is ubiquitously expressed in numerous human tissues and cell types, suggesting its important role as the functional HSV-1 gB receptor [81, 82]. HSV entry has been closely associated with actin-cytoskeleton reorganization . For example, it has been shown that HSV exposure induces the formation of filopodia-like cell membrane protrusions, on which HSV has the ability to bind and move toward the cell body. This movement of HSV on filopodia is termed surfing, and believed to be a spread strategy of the virus. In addition, HSV glycoprotein gB was found to be critical for virus surfing . Since NMHC-IIA binds to actin, and is involved in many events controlling cell movement and reshaping, it is quite possible that virus surfing on filopodia is mediated by gB binding to NMHC-IIA. More studies are needed to investigate the contribution of NMHC-IIA in virus surfing. An HSV gB lipid-raft-associated receptor has also been proposed by the observation that gB, but not gC, gD, or gH associates with glycolipid-enriched membranes (DIG) that represent raft-containing fractions. Since gC does not associate with DIG, gB association with DIG is suggested to be either heparan sulfate independent, or heparan sulfate dependent where gB is associating with specific type of HSPG, or has a differential effect compared to gC association with HSPG . Many lines of evidence support the presence of gH-gL receptor; nevertheless, the contribution of this gH-gL-receptor interaction to HSV infection is not yet fully understood. An observation was made in our lab where the cellular expression of gH-gL confers resistance to HSV-1 entry, indicating that gH-gL on the cell surface may result in sequestering the available cellular gH-gL receptor, perturbing the entry process of the virus . Soluble gH-gL has been shown to bind to αvβ3 integrin through a potential integrin-binding motif, Arg-Gly-Asp (RGD), in gH . However, mutating RGD to triple RGE (Arg-Gly-Glu) does not affect HSV-1 entry . gH-gL was also found to bind to cells independently of αvβ3, and that binding was found to be important for HSV entry and membrane fusion . Additional studies are important to identify the presence, and understand the significance of possible gH receptors during HSV infection. Using expression cloning, hfl-B5 gene was isolated that encodes a cellular protein found to be involved in HSV infection. B5 is a type-2 membrane protein that has an extracellular heptad repeat potentially capable of forming an α-helix for coiled-coils. B5 is ubiquitously expressed on many human cell lines. Transfecting porcine renal epithelial cells that are naturally resistant to HSV rendered these cells susceptible to the virus, which made B5 protein a candidate HSV receptor . It was proposed that B5 α-helix might interact with viral proteins containing α-helices such as gH to facilitate membrane fusion. However, a recent study revealed that B5 role in HSV infection is not during HSV entry, but during HSV proteins translation. B5 silencing did not affect entry markers including intracellular viral capsids delivery and viral tegument protein nuclear transport. On the other hand, B5 silencing was found to inhibit viral immediate early proteins translation . Advances in the field of HSV receptors provide new strategies for the generation of anti-HSV agents. Experiments done to identify the major HSV entry receptor in various cell types have exploited assays including antibody blocking assays, and the down regulation of HSV receptors utilizing siRNA [2, 62, 73]. These assays indicated that HSV infection can be inhibited by blocking the viral entry receptors. Copeland and colleagues have generated a 3-OS HS octasaccharide that has the ability to inhibit HSV-1 entry . Recently, our lab has isolated 12-mer peptides that bind specifically to HS, or 3-OS HS, and block HSV-1 entry. Interestingly, peptides isolated against 3-OS HS exhibited the ability to inhibit the entry of not only HSV-1, but also some divergent members of herpesvirus family including cytomegalovirus (CMV) and human herpesvirus-8 (HHV-8) . Recent studies have shown that HSV can follow different entry routes. Two major entry routes include: (I) a pH independent fusion with the plasma membrane of the host cell (II) endocytosis that may be phagocytosis-like where the virus triggers the fusion with the phagocytic membrane [83, 94]. This entry route may not always be pH dependent. Although all HSV glycoproteins function at neutral and low pH, gB undergoes minor conformational changes under low pH, the consequences of these changes are not yet known . Anti-acidification drugs such as bafilomycin A enable the identification of pH dependence during endocytosis. The differential entry route that HSV can follow is cell type-specific. For example, HeLa, human retinal pigment epithelial cells (RPE), and the CHO cell line expressing nectin-1 gD receptor allow HSV entry through low pH endocytic pathway. However, the monkey kidney epithelial cells (vero) allow HSV entry through the direct fusion with plasma membrane of the host cell [96, 97]. Regardless of the entry route followed, HSV enters host cells by inducing fusion between the viral envelope and the host cell membrane. Very little is known about what causes these differential entry routes. Since it is cell type specific, it is suggested that cellular determinants are responsible for choosing the viral entry route into the host cell. The contribution of gD receptors in determining the entry mode is elusive. One study has shown that co-culturing cells expressing gD with cells expressing nectin-1 resulted in the downregulation of nectin-1 in cells where HSV enters by endocytosis but not in cells where HSV enters at the plasma membrane. This suggested that gD mediated internalization of nectin-1 directs HSV to an endocytic mode of entry to cells . Also, a mutant HSV strain enters CHO-nectin-1 cells via the endocytic pathway, but fuses at the plasma membrane of CHO-nectin-2 cells . On the other hand, in another study, 35S-HSV uptake from the surface of CHO-nectin-1 cells was similar to that of CHO cells that lack any known gD receptors, indicating that the presence of nectin-1 does not promote endocytic uptake of HSV into CHO cells . Recently, several other cellular determinants have been suggested to be involved in determining HSV entry route. The gB receptor PILRα is one of these cellular determinant, where it is found to direct HSV to the fusion at the plasma membrane mode of entry. While HSV uptake to CHO cells and CHO-nectin-1 cells is mediated by endocytosis, HSV entry into CHO cells expressing PILRα was found to be mediated by fusion at the cell surface . Suggesting that an alternative entry mode for HSV was produced by the expression of the gB receptor PILRα. The integrin αvβ3 was also found to be involved in directing the viral route of entry. Overexpressing αvβ3 in CHO-nectin-1 cells, that naturally lack αvβ3, modifies the route of entry to an acidic compartment dependent on cholesterol-rich rafts and dynamin2. Moreover, overexpressing αvβ3 in J-nectin-1 and 293T cells modifies the route of HSV entry from neutral compartments to acidic compartments dependent on cholesterol-rich rafts and dynamin2 . Although HSV is considered a human herpesvirus, it has a wide species host range, and thus has the ability to infect animals and cell cultures of various species . There are reports of HSV experimentally infecting mice, rabbits, guinea pigs, zebrafish, and cultured Madin-Darby canine kidney (MDCK) cells [102–106]. The ability to experimentally infect non-habitual species by HSV suggests that HSV entry requirements, including the various receptors and entry modes, are quite commonly available and accessible on the cells of various host species. Another point that might explain HSV broad species host range is that HSV can exploit, as receptors, animal homologues of HSV receptors. For example, the murine homologue of human nectin-1δ isoform has a > 90% identity with its human counterpart, and act as a species non-specific entry receptor of HSV, pseudorabies virus (PrV), and bovine herpesvirus-1 (BHV-1). Interestingly, soluble murine nectin-1δ does not bind HSV gD at a detectable level, although it interacts physically with the virion . On the other hand, the murine homologue of human nectin-1 was found to be capable of mediating PrV entry, but not HSV entry . Other examples are the murine and zebrafish homologs of the 3-O-sulfotransferases enzymes responsible for modifying HS generating the HSV-1 gD receptor 3-OS HS [109, 110]. Interestingly, the expression of the zebrafish homolog of 3-O-sulfotransferase-3 isoform into the entry resistant CHO cells and zebrafish fibroblasts has been shown to mediate HSV-1 entry and spread . Various species that are susceptible to HSV provide important animal models for HSV research. The mouse model has been widely used in HSV entry, pathogenesis and anti-viral research, while guinea pigs and rabbits are suitable animal models for HSV latency research . Since zebrafish has a fully developed immune system, it has been suggested that this animal model be utilized to study HSV interactions with the immune system . These various specious have been infected experimentally for research purposes, most of them are not naturally infected with HSV. However, there are some rare cases where some of these animals get the infection naturally. For example, there are two reported cases of rabbits naturally infected with HSV-1 leading to encephalitis [113, 114]. An important application of HSV animal models is the development of an effective therapeutic anti-herpetic vaccine capable of inhibiting viral reactivation. Several studies have suggested that a crucial element for the generation of anti-herpetic vaccine, is a cellular response specific to HSV, where Interferon-γ (+) (IFN-γ(+)) CD8+ T cells seem to suppress spontaneous reactivation of the latent virus [115, 116]. The mouse model has been extensively utilized to study the various aspects of HSV infection, including virus entry and replication [117, 118]. Although HSV establishes latency in mice neural tissues and reactivates upon stimulation, spontaneous sporadic viral reactivation does not occur in mice [119, 120]. This is an important point for the development of anit-HSV vaccine, since HSV reactivation may result in serious diseases including the blinding herpetic keratitis. Therefore, it has been suggested that the mouse model is not the suitable model for studying the effectiveness of anti-HSV vaccines that inhibit viral reactivation . Two other animal models have been suggested to study the effectiveness of anti-HSV vaccine that inhibits spontaneous viral reactivation: rabbit and genie pig. HSV is capable of establishing latent infection in these animal models, and reactivate spontaneously causing disease, similar to HSV infection in human . Recently, a Human Leukocyte Antigen (HLA) transgenic rabbit model has been introduced for preclinical evaluation of human CD8(+) T cell epitope-based vaccines against ocular HSV infection . The ability of HSV to productively infect a wide range of hosts and cell types suggests that HSV has evolved to use multiple receptors and pathways to facilitate entry into multiple cell types. 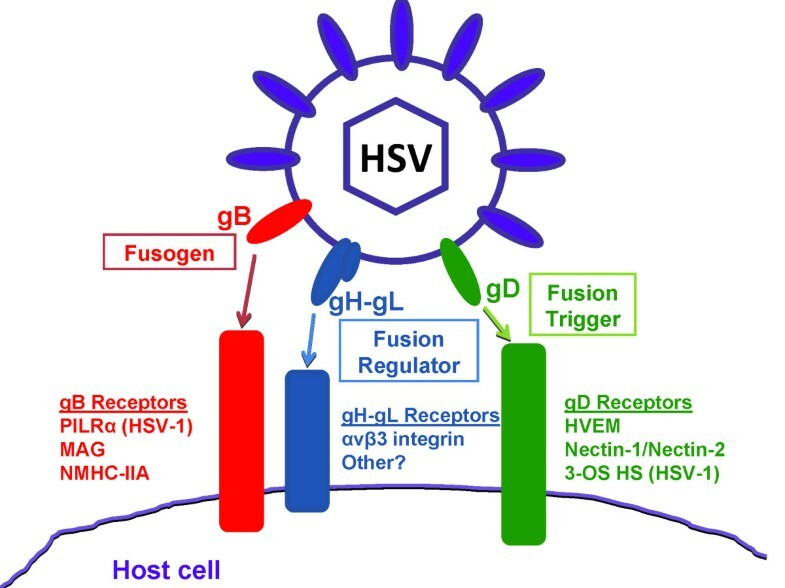 Regardless of HSV entry receptors or pathways utilized, HSV entry into host cell has common features among various routes of virus entry, including HSV fusion with the plasma membrane of the host cell. This indicates that HSV might recognize structural features of receptors that are conserved among various human and animal cell types. The presence of multiple entry receptors and pathways could be the reason of the wide range of hosts and cell types that can be infected by HSV. However this does not answer questions like: what dictates the utilized entry pathway and cellular receptors by HSV? This is particularly important in situations where more than one entry receptor is available for the virus to use on the host cell surface. Moreover, do the various combinations of gB and gD receptors utilized by HSV affect the entry and/or the infection process? Answers to such questions require conducting more studies to fully understand the process of HSV entry into host cell. Recent advances in the field of HSV cellular receptors and HSV entry glycoproteins' structures, interactions and functions have broadened our understanding of HSV entry into the cell. Such advances will definitely help in the process of developing potent HSV vaccines and anti-HSV drugs. The huge prevalence of HSV in the human population worldwide which increases the risk of acquiring HSV related diseases, including blindness, genital herpes, encephalitis, meningitis, especially in immune compromised patients and infants, urges for such development in the anti-HSV therapies. The authors are supported by NIH grants AI057860 (DS), AI081869 (DS), and a Core Grant EY01792. GK and DS contributed to and edited the manuscript. Both authors read and approved the final manuscript.